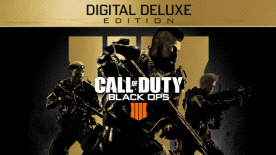 Digital Deluxe Edition includes the Call of Duty: Black Ops 4 game, Black Ops Pass**, Digital Edition Bonus Items, Digital Deluxe Bonus Items, and 2,400 Call of Duty® Points*. Black Ops Pass includes: “Classified,” a Zombies Experience available at Launch, 4 Additional All-New Zombies Experiences, 12 Multiplayer Maps, and 4 Exclusive Blackout Characters. "*Call of Duty®: Points (CP) will be accessible in Call of Duty: Black Ops 4 once CP are made available in game. Platform and region availability may vary and are subject to change.